Puffy eyes, or bags under the eyes, are not something you must just accept. You might mistakenly believe that for some people, bags are a natural part of aging, but for others, they might result from poor eating or sleeping habits. Either way, finding the right solution to dealing with these bags is a better approach then just learning to live with them. Between lifestyle changes and treatment options like Vivexin Revitalizing Eye Cream, you can get young, firm looking eyes once again. Why Aging Leads to Puffy Eyes? As one ages, the tissue and musculature of the face starts to lose elasticity. When you are young, the skin has firmness that you don't have later in life. This youthful texture holds fat in place. As the skin ages, it loses this ability and fat deposits migrate to the lower lids, causing the puffy appearance. The lack of elasticity, or tightness, also allows space to form within the skin under the eyes that can fill with fluid. This causes dark, half-moon circles to appear, as well as the swelling which most people refer to as puffy eyes. What Else Leads to Puffy Eyes? Bags under eyes are generally a cosmetic issue, but for some, they can indicate a medical problem. For example, exposure to an allergen will cause this reaction, i.e. an allergic reaction. Puffy eyes may also mean a hormone imbalance that may need to be diagnosed by a doctor. It might also be something as simple as sleep deprivation causing the condition. Changing some lifestyle options at home is the first step in treating bags under the eyes. This includes monitoring your salt intake, for example. Excess salt, or sodium, causes the body to retain fluid. This excess water is retained throughout the body and pools in the area under the eyes. Reducing the amount of salt you eat will help flush water out and decrease inflammation. Dealing with sleep issues is another approach. Try getting an additional hour of sleep each night. Puffy eyes might be the body's way of telling you it needs more rest. Changing the position you sleep in will help as well. The best way is to lie on your back with one or two pillows under your head to elevate it. This keeps fat, blood and water from pooling under the eyes. What about Treatment Options for Puffy Eyes? There are cosmetic approaches to reducing eye inflammation. 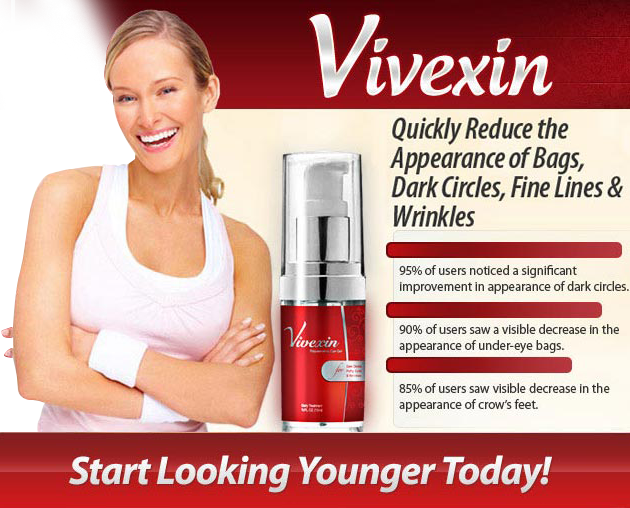 Products like Vivexin Revitalizing Eye Treatment work well for bags that form as you grow older. Vivexin takes a multifaceted approach to eye care. Haloxyl targets dark circles that often go with the bags. Eyeliss gives skin back some of its elasticity to reduce puffiness and boosting collagen. Matrixyl smooths out fine lines for younger looking and more appealing eyes. The combination of these three key ingredients makes Vivexin the go-to product to reduce puffiness, tighten up the skin and restore your youthful appearance. Nine out of 10 users surveyed found this treatment effective for swelling and dark circles. Once you rule out a medical cause for your eye bags and when you find lifestyle changes are not enough, look for a treatment option like Vivexin Revitalizing Eye Cream. 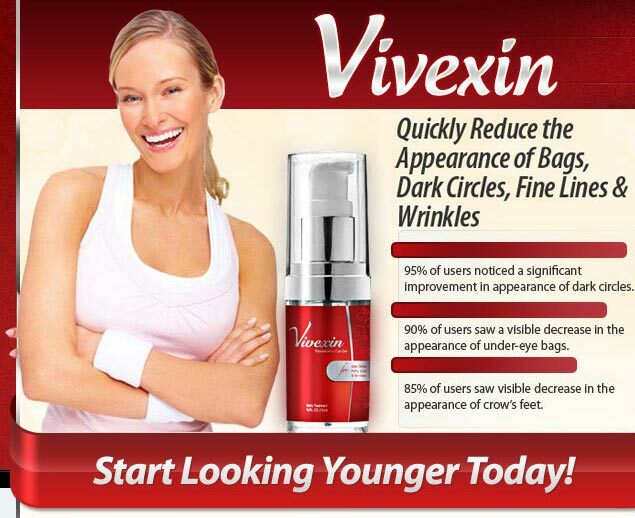 Experience the Amazing Age-Defying Benefits of Vivexin for Yourself Absolutely Risk-Free! 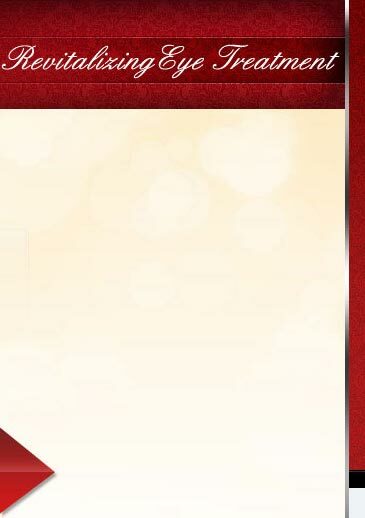 The Highest Quality Age Defying Beauty Cream Available! Find out why thousands of women are turning to Vivexin intensive eye cream to erase dark circles, reduce eye bags and diminish the appearance of fine lines & wrinkles. What once was only available through a plastic surgeons office, is now available to you. Try Vivexin absolutely risk-free for a full 90 days and experience the amazing age-defying benefits it has to offer. Copyright © 2012-2019 Vivexin - Speedwinds Nutrition Inc. All Rights Reserved.